Numbers - Both the back and shoulder numbers are two-color tackle-twill. 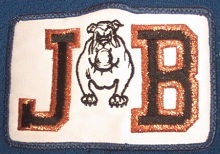 Namebar - Two-color tackle-twill letters attached to a namebar made of Airknit material. Tagging Neck - There is a Maska manufacturers tag, which is made of a dull thread-like material, in the neck. The size is usually handwritten on this tag in blue ink, which may or may not be faded from washing. 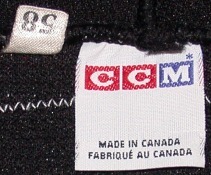 "Patents pending" is written on the back of the tag in both english and french. Tagging Hem - The CCM logo on the tail of the jersey is a two-color logo with blue letters on white blocks for both the home and road jerseys with the black and orange NHL shield embroidered to the right of the CCM logo. Regular Season - One set was worn for the entire regular season. Playoffs - A new set was worn for the playoffs. Tagging Neck - There is a Maska manufacturers tag, which is made of a dull thread-like material, in the neck. There is a small size flag to the left of the manufacturers tag. Tagging Neck - There is a Maska manufacturer's tag in the neck. The back of the tag is blank. There is also a small size flag to the left of the Maska tag. 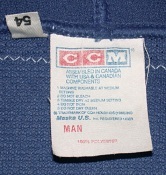 Tagging Neck - Most of the 93-94 jerseys have a CCM manufacturer's tag in the neck, like the one shown below. However, some of the 93-94 jerseys have the same neck tagging as the 92-93 jerseys. There is also a small size flag to the left of the manufacturer's tag. 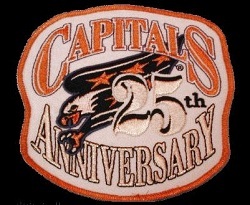 Patches - Capitals 20th Anniversary patch. The patch was added sometime in early November 1993. Tagging Neck - There is a CCM manufacturer's tag in the neck. The back of the tag is blank. There is also a small size flag to the left of the Maska tag. Numbers - The numbers are three-color tackle-twill numbers with black on white on bronze for home and white on black on bronze for the road jerseys. The numbers are made of three full layers. Namebar - The letters are three-color tackle-twill letters in the same color scheme as the numbers attached to a namebar made of Airknit material. The letters are also made of three full layers. Tagging Neck - For set 1, there is a Maska manufacturers tag in the neck with a small size flag to the left of the Maska tag. For set 2, there is a CCM manufacturers tag in the neck with a small size flag to the left of it. Tagging Hem - The CCM logo on the tail of the jersey is a two-color logo with blue letters on white blocks for both the home and road jerseys. The black and orange NHL shield is embroidered to the right of the CCM logo. Set 1 - Most set 1 jerseys have a stamp behind the crest that reads "CUSTOMISED BY CUTTING EDGE SPORTS FOR WASHINGTON CAPITALS SET#1 1995-96". The stamp is the same for both the home and road jerseys. Set 2 - Most set 2 jerseys have a stamp behind the crest that reads "CUSTOMISED by CUTTING EDGE SPORTS for the WASHINGTON CAPITALS 1996 set 2". The stamp is the same for both the home and road jerseys. Notes - 1995-96 is the first year of the blue, black and bronze jerseys. For the 1995-96 and 1996-97 seasons, the word "CAPITALS" appears below the eagle on both the home and road jerseys. Tagging Neck - There is a small size flag in the neck. The goalie cut jerseys have a CCM tag in the neck specifying that they are goalie cut. Tagging Side - There is a either a Maska or CCM manufacturers tag in the side of the body of the jersey. It seems that the set 1 jerseys are more likely to have a Maska tag and the set 2 jerseys are more likely to have the CCM tag. Set 1 - Most set 1 jerseys have a stamp behind the crest in blue and red that reads "CUSTOMISED for the WASHHINGTON CAPITALS CUTTING EDGE SPORTS SET#1 1996-97". Note that Washington is spelled incorrectly with two "H". Set 2 - The set 2 stamp is also found behind the crest and reads "Customised for the WASHINGTON CAPITALS by CUTTING EDGE SPORTS 1997 set#2" with Washington spelled correctly. Notes - For the 1995-96 and 1996-97 seasons, the word "CAPITALS" appears below the eagle on both the home and road jerseys. Set 1 - Set 1 was worn for most of the regular season. Set 2 - Set 2 was worn for just a few games near the end of the regular season. Numbers - The numbers are three-color tackle-twill numbers with black on white on bronze for home and white on black on bronze for the road jerseys. The numbers are layered so that there is only one full layer. The home jerseys have the black layer on the bottom, then a thin bronze outline sewn on top of the black and then a very thin white outline layer on top. Likewise, the road jerseys have the white layer on the bottom, then bronze, then black. This technique of layering is called reverse kiss-cut. The numbers for the third jersey are bronze on blue on white, where the bronze layer is on the bottom with an outline of white and then a thin outline of blue on the top. Namebar - The letters are three-color tackle-twill letters in the same color scheme as the numbers attached to a namebar made of Airknit material. The letters are layered exactly like the numbers. The letters of the third jersey are arched along the bottom with the beginning and end of the name being taller than the middle. Tagging Hem - The CCM logo on the tail of the jersey is a two-color logo with blue letters on white blocks for both the home and road jerseys. For the third jersey, the logo has black letters on white blocks. 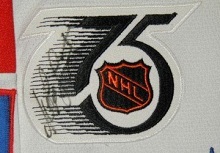 The black and orange NHL shield is embroidered to the right of the CCM logo. Set 1 - For the home jerseys, the set 1 stamp is on a white cloth strip that is heatpressed onto the back hem of the jersey and reads "CUSTOMISED EXCLUSIVLY FOR THE WASHINGTON CAPITALS by CUTTING EDGE SPORTS SET#1 1997-98". Note that the word exclusively is spelled incorrectly. For the road blue jerseys it is stamped behind the crest and very hard to read. I believe it says "Customised for the Washington Capitals by Cutting Edge Sports 1997-98 set#1". 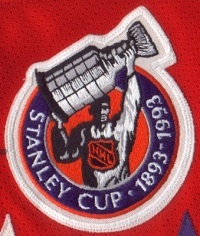 The set stamp for the third jersey is located in the sleeve and is stamped in blue and red and reads "Customized by Cutting Edge Sports for the Washington Capitals set#1 1997-98". Set 2 - I have not seen any evidence that the set 2 jerseys had set stamps. Notes - Beginning with the 1997-98 season, the word "CAPITALS" only appears on the road jerseys. They also added a black "third" jersey to be worn in certain games throughout the year. The third jersey was worn for the first time on January 25, 1998 and was worn a total of nine times in the 1997-98 season. There was only one set of black third jerseys. Set 2 - Set 2 was worn for a few games near the end of the regular season and the entire playoffs including the Stanley Cup finals. Numbers - The numbers are three-color tackle-twill numbers with black on white on bronze for home and white on black on bronze for the road jerseys. The numbers are layered so that there is only one full layer. The home jerseys have the black layer on the bottom, then a thin bronze outline sewn on top of the black and then a very thin white outline layer on top. Likewise, the road jerseys have the white layer on the bottom, then bronze, then black. This technique of layering is called reverse kiss-cut. The numbers for the third jersey are bronze on blue on white, where the bronze layer is on the bottom with an outline of white and then a thin outline of blue on the top. Patches - 25th Anniversary - For the 1998-99 season, the Capitals were planning to wear a patch on their third jerseys to commemorate the 25th Anniversary of the team, but after only a few games of wearing the patch (beginning January 1), the NHL forced them to remove the patch. Set 1 - The set 1 stamp for the home and road jerseys is multicolored and is located in the sleeve and reads "Customized by Cutting Edge Sports for the Washington Capitals 25th Anniversary 98-99 set#1". The third jerseys have the same stamp. Set 2 - The set 2 stamp for the home and road jerseys is located in red in the sleeve and reads "Washington Capitals 25th Anniversary 1998-1999 set 2". Notes - Some of the players wore their black third jerseys from 1997-98 instead of being issued new jerseys for 1998-99. The third jersey was worn a total of 16 times in the 1998-99 season. Set 2 - Set 2 was worn for a few games near the end of the regular season. The black third jerseys did not have a set 2. Tagging Hem - The CCM logo on the tail of the jersey is a two-color logo with blue letters on white blocks for both the home and road jerseys. For the third jersey, the logo has black letters on white blocks. 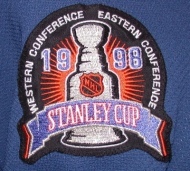 The black and silver NHL shield is embroidered to the right of the CCM logo. Set 1 - The set stamp for the set 1 jerseys is behind the crest in red and blue and reads: "Cutting Edge Sports HAS CUSTOMIZED THESE JERSEYS EXCLUSIVELY FOR THE WASHINGTON CAPITALS 1999-2000 SEASON SET #1". Set 2 - The set 2 stamp for the third jersey is located in the hem and is written in blue and red and reads "Cutting Edge Sports HAS CUSTOMIZED THESE JERSEYS EXCLUSIVELY FOR THE WASHINGTON CAPITALS 1999-2000 SEASON SET #2". Set 1 - Set 1 of the black jerseys was worn until mid-to-late February. Set 2 - Set 2 was worn from then until the end of the playoffs. I don't think there was a set 2 of the road blue jerseys.